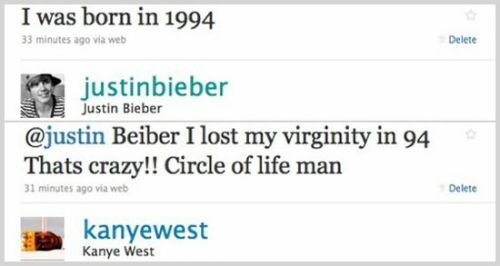 Lately, I just have a deep respect for the comedic gold that comes out of Kanye West. I just turn into a gigglebox whenever I read that he has spoken publicly. A while back I came across a snippet of something awesome. I thought it was funny the first time I watched it but I moved on, you know? Watched it once and called it good. Sure, it was funny but there was probably news about Justin Bieber I needed to get to. @50cent what’s up! What are u up to lately? When u gonna be a billionaire? Anyway, we then transitioned to the video of that something awesome I was telling you about. Josh Groban singing Kanye’s tweets. It is so far beyond funny I can’t even … there’s not a word for it! I literally cannot stop laughing. It’s SO good. I especially love the conference table tweet. Oh, and the “I love me!!!!!!!!!!!!!!!!!!!!!!! !” tweet. So. Good.